With 20 percent of British pet owners not currently having pet insurance, but admitting they had it in the past, insurance technology specialist Aquarium Software says the industry must investigate the facts behind the figures, and understand why animal lovers don’t find pet cover such a compelling choice second time around. Anita Bhanja and Mark Colonnese. Image used with permission. For copyright details please contact Aquarium Software. The average claim is now £750, with £1.3m paid out daily. 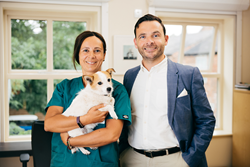 New treatments keeping our pets healthy cost but as a result, make insurance good value for money. While 38 percent currently have pet cover, the YouGov survey commissioned by Aquarium shows over two fifths (42%) of owners have never insured their primarily furry friends. This, despite the rising cost of vet bills and the fact only seven percent, of current and previous insurers, described the service from their insurer as poor when they had to make a claim. “With so many satisfied claimants, policy providers are getting something right, but 42 percent have never had pet insurance and for pet health these numbers need to change,” said Aquarium Software Director, Mark Colonnese. “Algorithms can identify similarities in those deciding not to renew and coupled with YouGov research, can give us significant insights into what needs to change to encourage more people to insure their pets,” he added. The best way to reduce premiums is to do your research before you purchase a pet. A breed genetically susceptible to certain medical conditions, for example - or an older pet - is going to cost significantly more to insure than a breed with a cleaner historical health bill, or a younger animal. But if it is all about the money, vet bills continuing to rise makes pet insurance look like a bargain – so what is going on?